"Community water fluoridation is now in its 50th year of use in the United States and is widely considered one of the most beneficial public health initiatives ever employed in the United States." - quoted from American Dental Association news release, "Study Suggests Too Much Toothpaste Causes Fluorosis"
(note the proclaimatory language in a news release disagreeing with a study warning against over-fluoridation). fluoridation of water, adding the mineral fluoride to city water supplies, is blamed for the noted decline in tooth decay since popular fluoridation began, in the 1940s. in spite of the increase in dental health attributed to fluoride, people continue to voice their opposition. i was so surprised to hear that people argued against fluoride. didn't they want good teeth? but if there were tradeoffs, was i an informed consumer of fluoride? no one ever gave me a choice! as a citizen of chicago, or swarthmore, or san francisco, fluoridation just seemed a given! what are the side effects? are smart people buying evian and bottled water to avoid things like fluoride and other unknown fortificants in our precious bodily drinking water? "The basic structural material of the body, collagen, is also disrupted by fluoride, causing tissues such as muscles, tendons, and ligaments to be excessively mineralized (see diagram below). Others such as bones and teeth may be deficient." the mottled vertebrae on the right present an alarming argument against fluorosis, but if our spines do look like that after drinking fluoridated water, and using fluoridated toothpaste, why aren't we all shaped like hunchbacks? "People who drink water containing fluoride well in excess of the [maximum contaminant level] over many years could get bone disease." the Environmental Protection Agency makes it sounds less likely ("well in excess ... over many years"), but when we consider the combination of fluoride offerings common in american lives: toothpaste, mouth rinse, trips to the dentist, besides water; all these together could add up to some notable amount of fluoride ingestion. but how would we know? evaluating the arguements presented by the pro-fluoride dental industry can be no less difficult, for example, in discussions about fluorosis. fluorosis, the whitening of the teeth signalling fluoride overdose, makes for a muddier debate. water fluoridation is an old argument, at least as old as the first efforts. 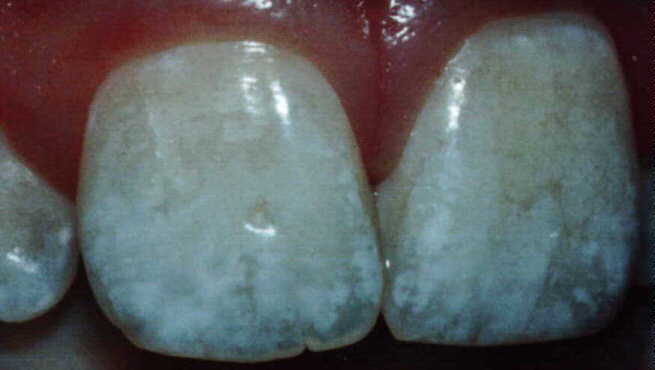 fluoride studies were initiated as early as 1902 because people who lived near water supplies with too much fluoride were suffering from these stained teeth. the debate has shifted back to oversaturation, but this time it is not naturally occuring, or the byproduct of aluminum manufacturing: the stained teeth nowadays come from people ingesting too much fluoride intended for tooth decay prevention. "Fluorosis is a frank sign of fluoride over-dose in childhood. It is an indicator that the destructive effects of fluoride are occurring in bone, connective tissue, immune and enzyme functions." - Elke Babiuk, Fluoride: Protected Pollutant or Panacea? this quote comes from Mr. Babiuk's web site, which opens with an enormous screen filling picture of fluorosed teeth (click the small picture above for the greatest fluorsis show on earth!). as the arguments against spinal mutation and bone deterioration are harder to prove, such cosmetic aberrations as white stained teeth are supposed to prove to us that fluoride is overused. Does the ingestion of optimally fluoridated water cause cosmetic defects in dental enamel? No. Drinking fluoridated water, at the level recommended for dental health, will not cause teeth to become functionally or cosmetically compromised. Fluorosis only occurs when more than the optimal daily amount of fluoride is ingested. - American Dental Association, "ADA: FDA overstates toothpaste danger"
optimal, optimal - but when people monkey with optimal levels of minerals, and include them in something as readily ingestible as water, they act without knowing the users' total fluoride intake. that leaves the users to judge and the users have no sense of appropriate fluoride intake, no idea how much fluoride is in their water, how much in their toothpaste, and how much the dentist uses on them. the Food and Drug Administration (FDA) proposes strong language warning against overfluoridation in youth, and the ADA opposes it. technology needs to be an all or none proposition? they decry creating unnecessary fear in the population. when the former "Head of the Toxicology Department of the Forsyth Dental Center in Boston, a world renowned dental research institution affiliated with the Harvard Medical School" weighs in against fluoridation, it's back to the drawing board. in a strangely worded twist, the ADA ultimately embraces fluorosis as a disease, and gently encourages people to follow their advice. "Fluorosis is a sign that fluoride is working," said Dr. Heber Simmons, Jr., a pediatric dentist in Jackson, Miss., and an ADA consumer advisor. "And while it can be treated, we'd like to help parents prevent it as much as possible." - American Dental Association, "Study Suggests Too Much Toothpaste Causes Fluorosis"
their means of prevention include primarily an exercising of restraint of fluorine dosage, especially for children. this responsibility rests firmly with the dentists, fluoride-technology experts responsible for yearly fluoride treatements i know i received when i was a wee one. "The study's author, David Pendrys, D.D.S., PhD, advises dentists and physicians to follow the ADA, American Academy of Pediatric Dentistry and American Academy of Pediatrics recommendations on fluoride supplementation. Those revised guidelines recommend that only children living in communities without fluoridated water receive fluoride supplements. but it is also up to parents to be diligent, questioning dentists and purchasing the right balance of fluoridated products (another instance of potential increased parental responsibility). is decay worse than fluorosis? as a consumer i don't know, but between toothpaste, water supply and my dentist, i am inundated with fluoride i have not been educated to choose. either way the disease of fluorosis is a wonderful metaphor - the saturation of health technology creates its own cosmetic and structural problems. fluoridation is now an entrenched technology, backed by fluoride suppliers, the ADA, and townspeople tired of arguing with natural health cranks. The investigators who first reported lesser decay rates in towns having naturally higher fluorine content in their waters were short-sighted in their research, as they failed to check the water and soil for other mineral values. Lo and behold, when this was done they found calcium, magnesium and a host of other elements were also present in greater amounts. in spite of his seeming across the board rejection of major medical technique, Dr. Meinig's approach here sounds rational - taking one element out of context and applying it as a panacea seems a bit shortsighted, perhaps there were more ambient reasons for relative tooth health in certain areas. that being the case, do we make all cities conform to certain healthy mineral levels? this is a similar line of thinking to food fortification - if we think we know things are healthy for people, should we just stick 'em where people can't avoid them? what's amazing is not that the standard is set so low - only teeth are protected, otherwise water is simply made potable; what's amazing is that teeth are such a priority, or that the technology of fluoridation is so convenient that it is now so omnipresent! "I did not use it in any way for my girls when they were growing up. In the beginning, like everyone else, my family also had cavities from eating too many sweets. When we learned to replace sweets with wholesome natural foods, the tooth decay stopped and it remained absent for over 25 years without the use of any form of fluorine. Not only did tooth decay stop, but enlarged, inflamed tonsils reduced to normal size and became healthy in color. Colds and other ailments were reduced considerably. You can be sure the sugar and cereal industries have reaped billions in profits because the use of fluorine has taken the pressure off their products as a prime cause of tooth decay." so fluoride is then a fix for the problems created by plenty. we would rather brave unknown side effects than give up sugar. fluoride is a system to protect the teeth of the mass of sugar eaters, and those who care to avoid sugar and fluoride might as well live off the grid. "[Arnold Green researching into anti-fluoridation campaigners] concludes that anti-fluoridationism stems from the same sources as other extremist political movements, in the anxiety produced by impersonal organization, rapid social change, and is a symbolic striking out against those agencies which threaten one's autonomy." "DO YOU HONESTLY BELIEVE that the U.S. Public Health Service, the Commission on Chronic Diseases, the American Medical Association, the American Dental Association and many other health agencies would favr fluoridation if any harm were to come to you? "The real issue is whether you are going to be guided by these guardians of your health or whether you are going to take the word of those who base their charges on unaccredited or unreliable sources who are not authorities on health and who are often led by those who are opposed to all medicine." the immediate and visceral response to that is "asbestos." large institutions charged with health maintenance make major mistakes. does that mean we should share in those mistakes collectively? or do the people who refuse to participate serve as useful challengers to never failsafe ideas? what goes unmentioned here is the right of the individual to choose. the editorial addresses itself towards people choosing between institutions and cranks. the presumption is not to provide information, because the battle was not being won by pro-fluoridationists with information alone. there's a kind of democratic tension happening here - representatives versus the unwashed masses. "...we have seen that fluoridation is almost a model of the unsuccessful innovation. While it is true that by 1960 it had been adopted by nearly one-third of the cities of the United States with 10,000 or more population, the fact is that its rate of growth was decelerating, and its spread seemed particularly slow in those areas in which fluoridation did not gain an early foothold. ... Of course, any innovation can expect some resistance when it is first suggested, but most of the data presented here indicate that fluoridation was more unpopular in 1965 than in 1952!" that book was written in 1969, so the situation may have shifted some. nevertheless, in february 1998 the Environmental Protection Agency announced that water companies must divulge to their customers the contents of their water. whether that leads to a widespread information based consumer reaction to fluoride and other water born additives will not be clear until after 1999, when the program is set to start. fluoride is enmeshed in a series of other technologies, histories, and encoded with its own statement about our technology priorities and directions. final (frivolous) note on fluoride: purity of essence! i would be remiss if i did not mention a most familiar fictionalization of the anti-fluoridationists. media representations of the fluoride debators are difficult to locate; a notable one is in Stanley Kubrick's film Dr. Strangelove: a crazed american general Jack D. Ripper is an anti-fluoridation freak and his basis for opposition is intimately tied to his manhood and his commie paranoia. "On no account will a Commie ever drink water, and not without good reason...Water is the source of all life. Seven tenths of this earth's surface is water. Why, you realize that seventy percent of you is water...And as human beings, you and I need fresh, pure water to replenish our precious bodily fluids... (Mandrake chuckles nervously) Mandrake, have you never wondered why I drink only distilled water, or rain water, and only pure grain alcohol?...Have you ever heard of a thing called fluoridation? Fluoridation of water?... fluoridation is the most monstrously conceived and dangerous communist plot we have ever had to face." General Jack D. Ripper: Mandrake, do you realize that in addition to fluoridating water, why there are studies underway to fluoridate salt, flour, fruit juices, soup, sugar, milk... ice cream. Ice cream, Mandrake, children's ice cream. Group Captain Lionel Mandrake: Lord, Jack. Mandrake: Aye, no, no. I don't Jack. Ripper: Nineteen hundred and forty-six. Nineteen forty-six Mandrake. How does that coincide with your post-war Commie conspiracy, huh? Its incredibly obvious isn't it. A foreign substance is introduced into our precious bodily fluids without the knowledge of the individual. Certainly without any choice. That's the way your hard-core Commie works. Mandrake: Uh, Jack, Jack, listen, tell me, tell me, Jack. When did you first...become...well, develop this theory? Ripper: Well, I, uh...I...I...first became aware of it, Mandrake, during the physical act of love. Ripper: Yes, a uh, a profound sense of fatigue...a feeling of emptiness followed. Luckily I...I was able to interpret these feelings correctly. Loss of essence. Ripper: I can assure you that it has not recurred, Mandrake. Women uh...women sense my power and they seek the life essence. I do not avoid women, Mandrake. Ripper: But I...I do deny them my essence.